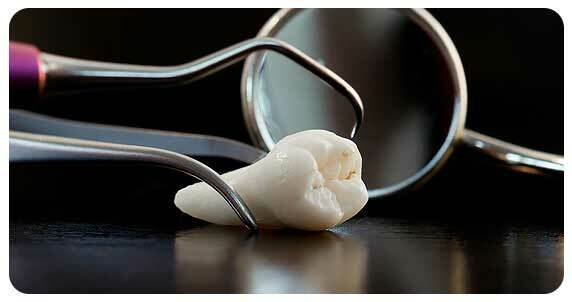 Wisdom tooth extraction is a surgical procedure to remove one or more wisdom teeth. Wisdom teeth are the four permanent adult teeth located at the back corners of your mouth on the top and bottom. These teeth are considered as the hardest ones. Wisdom extraction may be done for several reasons. The wisdom teeth may come in creating an issue for surrounding teeth pushing them out of the way or dispositioning . This can cause a type of domino effect with the rest of the teeth in the mouth including making the front teeth appear very crowded. This is one reason that extraction may be elected. Additionally, the wisdom teeth can do damage to the surrounding gums given how they come in. They could tear the gum and cause sores. This could ultimately lead to infection of the gum, tooth and/or jaw. An abscess may occur needing the tooth to be removed. The wisdom teeth extraction procedure usually involves an incision to open the gum, and sometimes a small portion of the bone may need to be removed to provide access for the wisdom teeth removal. The wisdom teeth may also need to be divided into segments so it can be removed safely and easily. Perfect wisdom teeth technique and a lot of experience is a must for these surgical procedures. The incision in the gum may then need to be closed with stiches (these are dissolvable in our practice). The patient is always well monitored during the wisdom teeth removal surgery, and a set of instructions are given and discussed for the post-operation recovery period.